The Saff is closed now. In its place, the Naumi Liora stands. 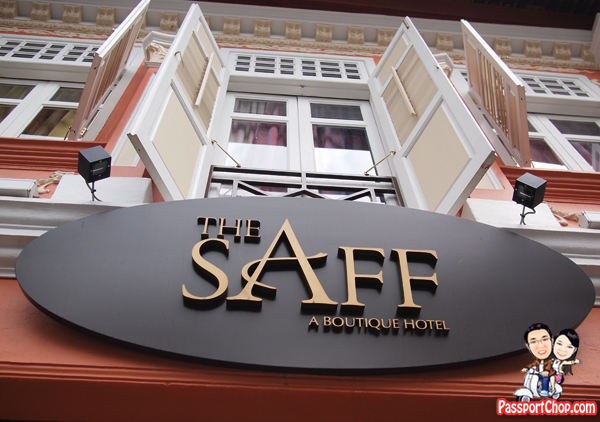 The Saff at Keong Saik Road was opened in October 2010 after a huge overhaul of its previous self (Royal Peacock Hotel). 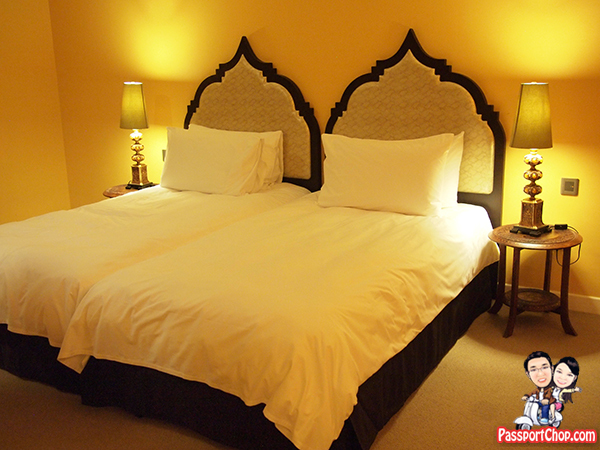 This is a 79-room boutique hotel housed in a heritage building dating back to the 1900s. Taking its name and inspiration from the spice saffron, The Saff is the second independent property managed by the hospitality group, Grace International, creator of the trendsetting boutique hotel, The Scarlet, that has won numerous tourism and design awards. 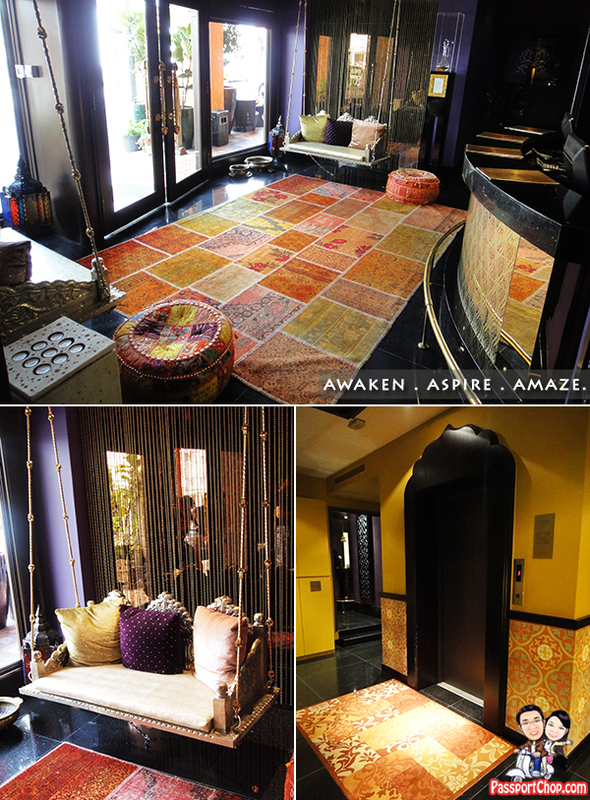 The saffron flower is a key inspiration for the hotel’s name and colour palettes. Rich purples, soft mauves, intense yellows and burnt oranges create heady and exuberant colour combinations to surprise guests with a refreshing outlook. The experience begins even before guests step through the door with the richly covered terracotta facade of the hotel accented with white, evoking fields of saffron spice. The five-footway of the hotel entrance is paved with Turkish inspired pattern tiles that act as a welcoming focal point to the main entrance. The lobby, a picture of majestic opulence is flanked by two classical Indian Jhoola swings. The floor of polished absoluto black granite provides reflection and contrast to the richness of interior. The rug is made up of a mosaic of antique Turkish rugs in patterns that are culturally relevant to the concept. The walls take on the colours of the saffron crocus of purple, gold, and accented with a focal of teal. The friendly service staff await guests’ arrival behind a softly up-lit front counter of polished and etched brass panels, referencing the Orient. On each side of the counter, two Persian inspired niches are softly back-lit to highlight wrought iron infill panels and illuminating the teal walls behind to create a nice juxtaposition with the purple walls. Overhead a recessed ceiling feature glows with backlighting and mirrored surface to reflect the activities below. Modern contemporary artworks are displayed within the lobby area, together with intricate sculptures, paintings and other fascinating details. Bold lighting fixtures are used as art pieces while adding a dramatic sense to these installations by casting unpredictable shadows on the walls. The accompanying corridors to the rooms are carpeted in a simple textured sisal carpet teamed with tan coloured walls. Guests are received by a colonnade of guest room doors that reflect the vibrancy of The Saff. Each door plays an alternating colour pattern of lime green, claret and teal with stenciled contemporary motifs from different ethnicity. Behind each coloured door represents the different meticulously conceptualized room that invokes different senses. We stayed in a Deluxe Double (about 30 sqm) – the top category of rooms available at The Saff. Each room consists of a writing desk that is fixed with highly sculptured legs that are each different for a quirky twist with their forms playing off one another. The soothing soft mauve walls are juxtaposed against cool teal accents while intricate furniture is placed against the rooms’ cool undertone palette and interesting shadows are cast onto the walls with a unique perforated hanging lamp. Classic Indian, Persian and Thailand architectural archways inspire the profile of the headboard and next to the comfortable beds, authentic Saharanpur carved tables from Northern India are instantly modernized with a flash of bright accent colours. Lights are cast to create patterns of light and shadow on the surrounding surfaces. Authentic Northern Indian Saharanpur carved table by the bed is given a contemporary touch with the play of internal lights that create dances of light and shadow on the surrounding surfaces. The classic architectural headboard and the pediment of the wardrobe in each room take inspiration from classic architectural profiles, modernized by the distillation of details. The use of metallic sheen of faux snakeskin upholstery adds depth and richness. The Saff is ideal for adventurous travellers who want to experience the nostalgia of Singapore’s yesteryear and the bustle of the city at just a stone’s throw away. It is also strategically located near Chinatown, the financial district, shopping malls, trendy bars and clubs. 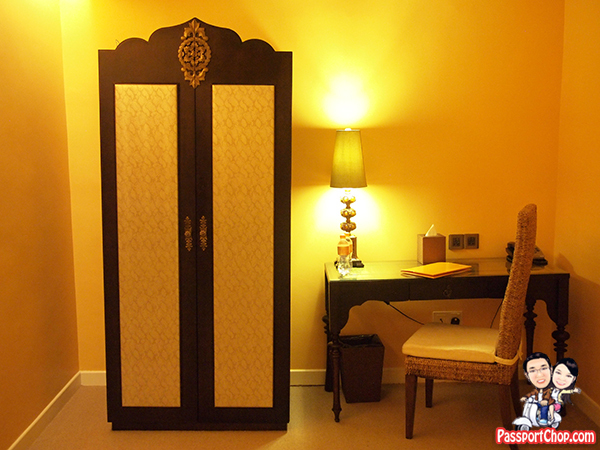 The hotel aims to offer a rare and precious experience to travellers at competitive prices. Keong Saik Road, a former infamous red-light district in the 1960s was once teeming with ladies of the night who prowled the colourful street while triad members performed their illegal activities. Today, the area is completely transformed and The Saff is now surrounded by hip restaurants, trendy bars, quaint cafes, sophisticatd art galleries and intimate bookshops. The former pre-World War 3-storey building has its traditional features and architectural structure kept intact. From its gorgeous wall carvings to the original unglazed orange clay roof tiles, these conservational features are preserved perfectly for guests who enjoy a heritage tour down Keong Saik Road. Behind The Saff lies the charming and tranquil Duxton Plain Park, perfect for a quiet stroll while taking in the beautiful greenery and crisp air. The Saff offers three different room categories – Standard, Superior and Deluxe. Each room features designs that fuse in exciting ways, cultural elements from different countries inspired by the ancient journeys of merchants and traders that plied the spice routes – Spain, Persia, Morocco, Turkey, India and Thailand. With three distinct design concepts and the rooms’ conserved structure, guests are invited to encounter a deliciously sublime experience each time they stay at The Saff. 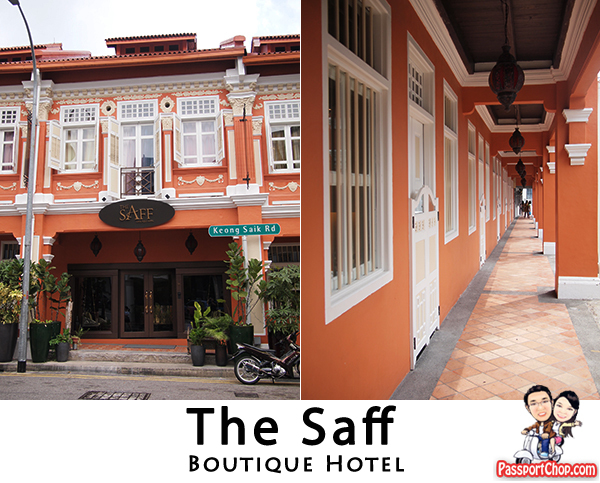 Room rates at The Saff start from S$230++ per night. For reservations or further information, please call +65 6221 8388 or visit www.thesaffhotel.com. Great place a bit far though﻿ from attractions. I love to stay here. great place i was staying in agust 21. this hotel was really woberful when im staying there it is my first time i like all stuff there very friendly. i will be back soon. Hey, that’s powerufl. Thanks for the news. Seems excellent … Economical rates with excellent rooms .. I am coming to Singapore tomorrow 17th Dec 2011 and I would like to see the hotel and room before I make it my choice … so far I am on it.